As you turn off Highway 82 onto Brush Creek for the seven-mile drive into Snowmass you are struck with the expansiveness and beauty of the landscape. The citizens of Snowmass, a small resort town, assessed themselves over $8 million in the past decade to insure that this pristine entrance maintained a scenic corridor with no unnatural physical obstructions. It is indeed a beautiful drive into Snowmass. One is impressed by the fact that there are no power poles and overhead power lines. Holy Cross Energy (HCE), a membership electrical cooperative, had been in a 10-year process with Snowmass to put a sub-station and a new transmission line in town in order to ensure reliability. The Public Utility Commission (PUC) of Colorado insists that facilities have enough energy and capacity to service the peak load times. That peak load time in Snowmass is, Christmas day, when the town is full with retailers, hotels, the ski area, and restaurants are operating at peak capacity. The time had come to provide reliability by building a new Snowmass sub-station and transmission line. This transmission and sub-station project generated enough stress over the decade to have one of the senior members of the HCE project team remark: "I had hoped to retire before we had to tackle this Snowmass project again!" It was October of 2002 and there was no avoiding the reliability issue – Snowmass/Aspen and the whole upper Roaring Fork Valley’s electrical delivery system was in jeopardy of failing unless a sub-station and transmission line were approved and built as soon as possible. Complicating HCE’s decision to proceed at this time was the total disruption of the residents and political system in Snowmass by the approval process for a large-scale commercial/residential project called Base Village. Base Village approvals were stuck in the formal system and had created enormous conflict throughout the community. Positions had been taken pro and con and citizens were demonizing each other over these positions. HCE found they were going to seek approval at the worst possible time. Hal Clark is on the Board of HCE from the Aspen District, which includes Snowmass. While he knew that in the end they could use the power of the PUC as the final authority, he also knew that such an approach would do irreparable damage to HCE and the relationships they had nurtured with their co-op members over the years. His search for an approach that would be non-confrontational brought him to James Kent Associates (JKA). Our company has a reputation for approaching projects by reducing complexity created by formal approval processes. This is done through increasing citizen participation and ownership in the project. HCE’s embedded management ethic of listening to their membership was an ideal match for a citizen based non-conventional approach. The HCE team that had been working on this project was Richard Brinkley, General Manager-Regulated Services who directed the project; Craig Murray, Aspen District Manager who was responsible for insuring reliability of the present distribution lines that ran to Snowmass from the Aspen sub-station; and Walt Dorman, Construction Engineering Supervisor who was responsible for corridor and sub-station site selection and construction. The JKA team was made up of Robert Schultz, Planner, who was assigned the task of taking the project through the formal approval process to reduce exposure to the HCE team; John Ryan, Economist, who was responsible for the informal community organization work; and myself who directed our part of the project. By the time JKA came on board the HCE team had already designed seven overhead corridor options; six overhead and underground options and three underground options. 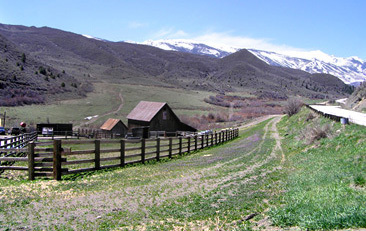 They had also selected 5 sub-station sites one of which was on Pitkin County Open Space land, a site with built in conflict right from the start. HCE made it clear that all 48,000 ratepayers would share the cost for a new substation and standard above ground transmission lines, as it would increase reliability for their entire system. If the local valley governments asked for all or part of the line to be placed underground, then they had to agree to a rate increase to pay for the incremental cost of an extra $7.8 million to bury the line. With this information the JKA team went into the community to understand the decision-making dynamics and the actual communication system people use everyday to keep each other updated and to resolve issues. There is an informal communication system in every community that operates through word-of-mouth networks and gathering places. JKA’s mission was to find the informal networks that are key to understanding the traditions, beliefs, and values that underpin and direct decisions at the formal level and to engage them. If the citizens gained social ownership of a project they would hold the elected officials accountable to their desires, thereby reducing or eliminating ungrounded attacks on the applicant – in this case HCE. A description was done in the village to identify what issues already existed in the community. This is one of the first activities of JKA. It was undertaken so that HCE would not inadvertently buy into issues created by some other entity. A project proponent has to own their own issues and develop protection to not have other issues loaded into their approval process. This is called "issue loading" and is deadly for many projects. It is often the silent killer-losing the project not on your own doings but by not being aware of issues that have been loaded onto your project, over which you have little or no control. The first task in the prevention of issue loading was to keep HCE from being pulled into the three yearlong brutal fights over Base Village. The electrical reliability issue had been building for several years with or without Base Village. It was not in HCE interest to have the new sub-station and transmission line tied to this project of 1 million square feet of new development. The conflict over Base Village came from using a top down approach for their approvals. They relied on the formal system as the beginning and ending point taking a "sell the citizens on the goodness of the project" approach that led to the citizens reacting to and attacking their plans. The second task was to not let the project get trapped in the historic and current conflicts between Pitkin County and the Town of Snowmass. The project had to get approvals from both governmental entities-the transmission line is in Pitkin County and the sub-station is in Snowmass. HCE did not want to be used as fodder to furthering the long time conflicts between these two units of local government. The project stayed independent of these disagreements by knowing the issues that created the conflict. Knowing the source of these issues allowed HCE to avoid unintentionally taking one side or the other. Creating a trust environment that allowed working independently with the entities and not in joint sessions was essential. Joint sessions often look efficient and time saving. However such structured sessions can also be a trap. Applicants can be compromised or used through no action of their own. Working within the informal networks allows the project proponent to take the project directly to the people. In order to achieve a sufficient level of agreement to proceed on a major project, the community must engage in widespread public discussion of the issues at a level where citizens’ "interests" in their community is the core topic. Formal meetings, without informal networking, bring out people who already have a "position" on the issue. It is working at the "interest" and not the "position" level that produced the ideas that HCE incorporated into their successful approval process. In order to align the transmission and sub-station project with the community, the key beliefs and traditions that Snowmass residents live by had to be discovered. The project development would be associated with those values wherever possible instead of trying to force citizens to fit into HCE technical proposal. A sense of fairness. The overhead power line corridors were in trouble right from the start. Citizens especially did not want 40 to 60 foot power polls sweeping up Brush Creek – the same area where the community invested $8 million for visual protection through public land acquisition. Once the community saw the more than 10 overhead alternatives and discussed the routes, they moved to the conclusion that the line should be underground. The main reason: "It would not be fair to subject a neighbor to a power line corridor that they did not want in their own environment." The citizens wanted to avoid any decision that would pit neighbor against neighbor, as was the case with Base Village. Taking care of their own. As a companion to a sense of fairness there were strong beliefs and practices that indicated residents mobilized to take care of their own issues. There was a pride in this ability as related through stories, to rise to any occasion and figure out how to manage intrusions into their environment. Citizens of Snowmass are independent and proud and are not prone to ask for outside help. A passion for facts. JKA held Chat Sessions in people’s homes and in every session there were several people with calculators. Often these were owners and executives of companies who had retired in Snowmass. Whenever we were doing our numbers we were being checked out, corrected and the numbers refined. The project had its own citizen-based mathematicians! They helped figure out the surcharge formulas, and of course since they did them-they owned them and became part of the project support. Relationship to geographic place. It was recognized early that the citizens knew their community geography and terrain extremely well. Using this relationship to place was critical for the project in three ways. It was also clear that an air-cooled sub-station that took 2 acres of land was not going to fit into Snowmass. It is a resort community and 2 acres of land is a rare premium. Besides no one wanted an "ugly sub-station like Carbondale has" to quote numerous people. The JKA team took this back to HCE and they concurred that the citizens were right. Knowing this, HCE built a Gas Insulated System (GIS) where transformers could be housed in a building. This system came from Europe along with engineers to build the station. The sub-station is located in two small structures that look like barns with stone siding, tin roofs and barn wood trim. Only 8,500 sq. ft. of space was used instead of 88,000 sq. ft.
HCE had five alternative sub-station sites picked, all of them potentially controversial. The final sub-station site was selected by several citizens who knew the terrain, geography and that the Town of Snowmass owned land next to the Town cemetery. The site turned out to be ideal with no controversy tied to the site since citizens were in on the selection. The sub-station can be seen as you drive into Snowmass and take a left hand turn onto Highland’s road. 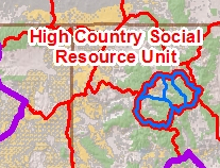 Both a "sense of fairness" and "taking care of their own" helped HCE work out the determination with the people the upper limits of a surcharge that would be assessed for the under grounding of the transmission line up Brush Creek. The estimated cost was an additional $7.8 million for which the residents would have to cover above and beyond their current monthly bills. This was a most exciting discussion throughout the community. They came up with a 15% increase over 33 years as a tolerable threshold and a 20% breaking point. HCE decided after much calculation that they would work to come in under the 15% mark. Richard Brinkley, General Manager-Regulated Services, HCE announced in April of 2006, to everyone’s delight, that the actual surcharge was 11.447% well below the 15% threshold and significantly under the 20% breaking point. To date there have been no complaints of the added amount on the monthly bill, once again confirming decisions that people participate in are owned by them. Gas Insulated Transmission Substation on 8,500 square feet of land substituted for an 88,000 square feet Air Cooled Substation. 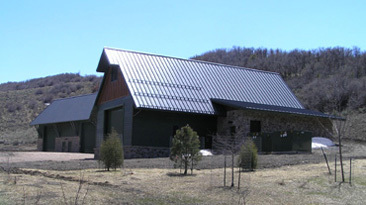 The unique Gas Insulated Substation is designed to look like barns on the landscape. With the citizens in social ownership of the project, all disruptive issues were avoided. Bob Schultz of JKA managed the project through the approval process. There was no citizen opposition at any of the formal hearings. The project was completed in December of 2005 with the sub-station and transmission line being energized at that time-a little more than three years from start up to finish. A local company did the underground corridor work partly because they were sensitive to the fact that they were working in a seven-mile stretch of land that must accommodate high levels of traffic and environmental integrity. A local architect designed the sub-station. A bike path costing about $900,000 is scheduled for the top of the right of way paid for by the Pitkin County Open Space fund. Citizens of Snowmass currently take visitors to see "their" small, intimate and attractive sub-station. The sub-station and underground power line are the result of Holy Cross Energy risking a different approach to project approval. As Richard Brinkley said after the approvals from both governments were final: "In the end we could have legally persisted and could have been the last one standing in a terrible fight, but this way — we all feel good about each other and the project, have built long term relationships, learned from each other — citizens, government, HCE. We at Holy Cross have enhanced our commitment as a co-op to "listen to our membership." Dr. James Kent is President of JKA Group, a global cultural analysts firm, and can be reached at 970.927.4424. Explore and contribute to the field of social ecology as a CSEPP intern. Welcoming students from all backgrounds and disciplines. Learn more! Enhance project effectiveness by aligning your management areas to socially meaningful. Learn more! 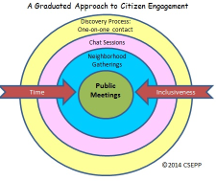 Explore the concepts behind CSEPP's approach to public engagement: community archetypes, stages of citizen issue development, and more. Learn more! and institutional interests while promoting valued social change.